Liverpool-based Total Glass has helped to secure the future of a dilapidated city youth centre by donating energy-efficient, smart new windows to a project shown on BBC One’s DIY SOS Children in Need one-off special. 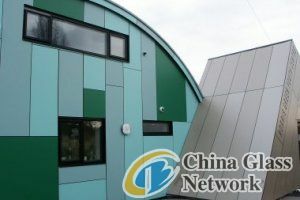 The ‘Big Build’ saw Norris Green Youth Centre, just a few miles from Total’s 100,000 sq ft factory, transformed over nine days. Some 18,000 man hours went into the project, with a 200-strong volunteer workforce on site at any one time. Total Glass, one of the North West’s longest-established PVC-U and aluminium window and door fabricators, was approached by its social housing client, Liverpool Mutual Homes for help with this cause. The firm was among hundreds of suppliers offering their time and skills to restoring the 52-year-old building in one of the most deprived areas of Liverpool. Total’s specialist team supplied 17 high quality PVC-U windows - seven on the front, nine on the side and one at the rear – for the building, which resembles two aircraft hangars placed next to each other. The new low-maintenance windows played a pivotal part in the modern transformation of the facility and will keep the centre safe, secure and fully draught-proofed for many years to come. Manufactured to Secured By Design specifications, the front street-facing casement frames were finished in an external black woodgrain foil with white on the inside to maintain a lighter interior. The white rear and side windows incorporate laminated glazed units for additional security and vandal-resistance. All the windows were installed by main contractors Bramall Construction. The centre is regarded as a beacon of hope in the local community, transforming the lives and hopes of young people in the area. At least 50 children and young people attend the centre every evening, seven days a week.